Asalha Bucha Day [วันอาสาฬหบูชา: wan aa-săan-hà buu-chaa] marks the day when the Lord Buddha delivered his first sermon known as “Dhammachakkappavattanasutta” (ธัมมจักกัปปวัตนสูตร) which he preached to five ascetics at Benares in India over 2,500 years ago, as result all of them attained enlightenment and was ordained by the Buddha as the first ever Buddhist monks. Hence, the origin of Buddhist monks, we see wearing orange color saffron. It falls on the full moon day of the eighth month of the lunar calendar year, generally in July. Buddhists participate in the ceremonies by performing a variety of Buddhist activities at the temples, mainly merit-making ceremonies. They offer food and alms to monks, give donations, listen to sermons, and observe the Five Precepts or the Eight Precepts. Some practice meditationม some more devout ones also practice renunciation by wearing white robes and staying in the temple for a number of days. They chant prayers, abstain from all kinds of immoral acts, and try to have their mind purified. 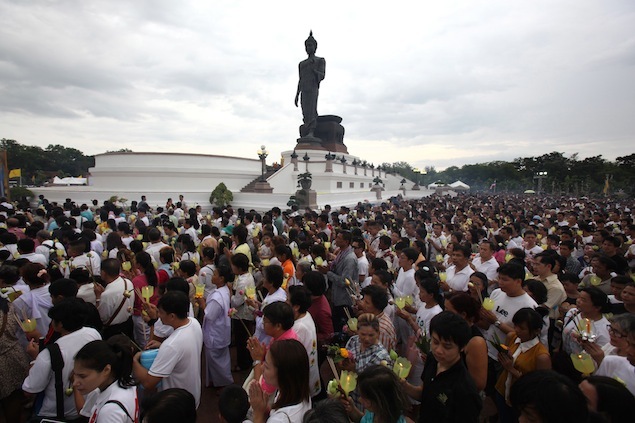 Thousands of Buddhist devotees join a wian tian ceremony at Buddha Monthon in Nakhon Pathom. Photo from Bangkok Post. In the evening of the Asalaha Bucha Day the believers join the Candle Light Procession, the “Wian Tian” (เวียนเทียน), where people will walk three times around a Temple in a clockwise direction, carrying a lighted candle, Joss sticks and flowers which will later be given as an offering to pay homage to the Lord Buddha. “Wian” (เวียน) means to circle and “Tian”(เทียน) is a candle. The day after Asahna Bucha is another significant day which marks the start of the three-month ‘Phansa’ period which is referred to as ‘Buddhist Lent’. Asalha Bucha Day is also a public holiday in Thailand. It is illegal to buy and sell alcohol on this day, except in hotels. Have you ever joined any Buddhist activities? I was wondering what the story is. I’m in Chiang Mai now, and saw a procession yesterday. Tonight I’ll look for a wian tian. 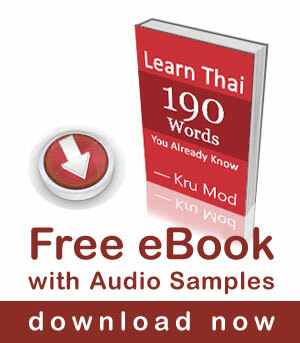 Wow great experience…another reason to love Thailand & the Thai people. Oh and thanks goes to Krue Mod once again for this information. Much appreciated! Thanks as allways you are so hellpful to make farang understand your nice culture. hi mod, on july 30th 2011 i joined some buddhist activities, at the time i had no idea what was really happening….other than, it was something for buddhism! and it was important! i spent about 2 months travelling through the isaan area in Thailand, i was very lucky to stay with a lovely family in Yasothon, who introduced my to the local monks on a visit to the temple, the temple was still in construction and had lots of local people coming to help the monks to build the temple….so i offered to help in any way possible. i went there most days to help and to actually learn a little bit about buddhism. it was not easy because i speak very little Thai and had only one person around who spoke some english, but one day the monk had said he liked me and asked the family i was staying with to invite me to a buddhist event/activity, i of course said it would be a honour and a pleasure to attend, and i actually went in the same car as the monks. but as i said at the start of this story i had no idea what the details of this day was about……untill now!! thanks to you i now know i had been invited to join the monks on asalha bucha day. i knew i was very privileged to be there (even if i wasnt sure what was happening) and i was told by a monk (who speaks english) that i am the only ‘farang’ to have ever been to this particular event! 🙂 as i say before i feel very lucky and privileged, and i have some amazing photo`s and memories of that day that will never be forgotten. thanks for helping me to know more about this day.